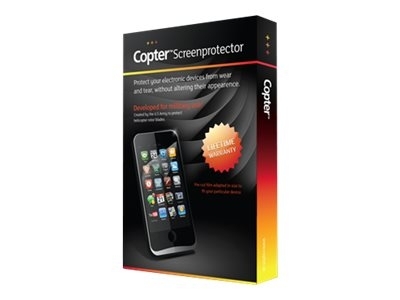 Copter Screenprotector consists of an extremely durable material originally developed for military use. The material is an offshoot of a urethane film that was developed by the U.S. Army during the Gulf War to protect helicopter rotor blades from the abrasive desert sand. The film withstands freezing temperatures; high heat, oils and gasoline, and wear and tear caused by rocks and other abrasive elements.